“A more unpromising theatre of war was never seen,” said another. Ulysses S. Grant, commanding all Federal armies, opened the campaign with a vow to never turn back. Robert E. Lee, commanding the Confederate Army of Northern Virginia, moved into the Wilderness to block Grant’s advance. Immovable object intercepted irresistible force-and the Wilderness burst into flame. With the forest itself burning around them, men died by the thousands. The armies bloodied each other without mercy and, at times, without any semblance of order. The brush grew so dense, and the smoke hung so thick, men could not see who stood next to them or in front of them. “This viewed as a battleground, was simply infernal,” a Union officer later said. Driven by desperation, duty, confusion and fire, soldiers on both sides marveled that anyone might make it out alive. For more than a decade, Chris Mackowski has guided visitors across the battlefields of the Overland Campaign. 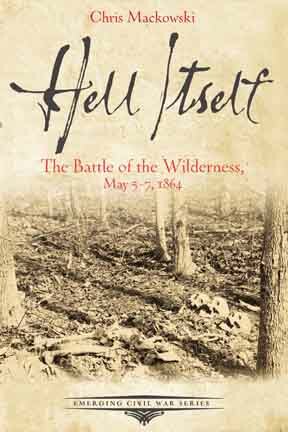 Now in Hell Itself he invites readers of the Emerging Civil War Series to join him in the Wilderness-one of the most storied battlefields of the Civil War. About the Author: Chris Mackowski, Ph.D, is the editor-in-chief of Emerging Civil War and the author of more than a dozen books. A professor of journalism and mass communication at St. Bonaventure University, he’s also historian-in-residence at Stevenson Ridge, a historic property located on the Spotsylvania battlefield. Chris is a former historian at Fredericksburg and Spotyslvania National Military Park, which included the Wilderness battlefield.